Relax and enjoy views of the ocean and city from your over 1,000 square foot private lanai! 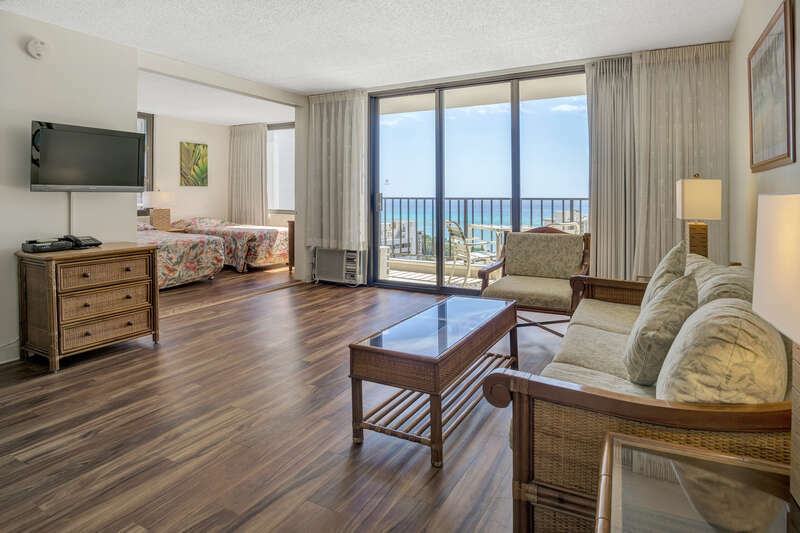 This condo is the best of the three suites in the Waikiki Banyan with an extended lanai because it is the only extended lanai with an ocean view. In addition, this suite is one of the few units with a washer and dryer in unit. Nautical style furnishings and decorations. Freshly painted. New carpet installed in 2017. The bathroom vanity and shower are separate for added privacy. Enjoy a fully-equipped kitchen that includes refrigerator, range, microwave, rice maker, coffee maker, and other standard kitchen wares. Kitchen includes refrigerator, range, microwave, rice maker, coffee maker, and other kitchen wares. Convenient sleeping arrangements include a queen size bed in the bedroom, along with a sofa sleeper in the living room. There is also a sliding partition that can be left open or shut it for a private bedroom. 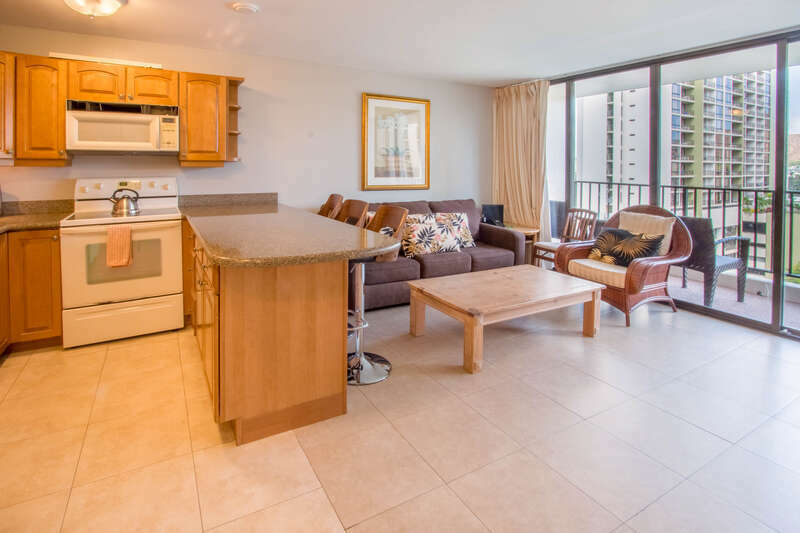 Condo is on the 6th floor recreation deck level which is complete with a swimming pool, two hot tubs, sauna, tennis court, basketball court, barbeque grills, and other amenities! Save money and enjoy the convenience of a full kitchen, FREE covered parking, TV with cable, FREE in room WiFi and FREE local and toll free phone calling. A/C unit in the living room. 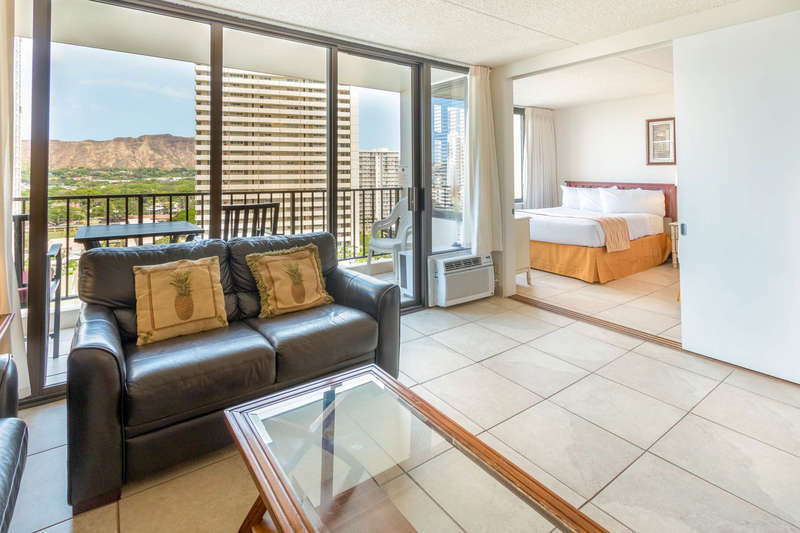 We have gone out of our way to make your stay in Waikiki spectacular so take advantage of all of the extras we provide so you can get the most out of your vacation.